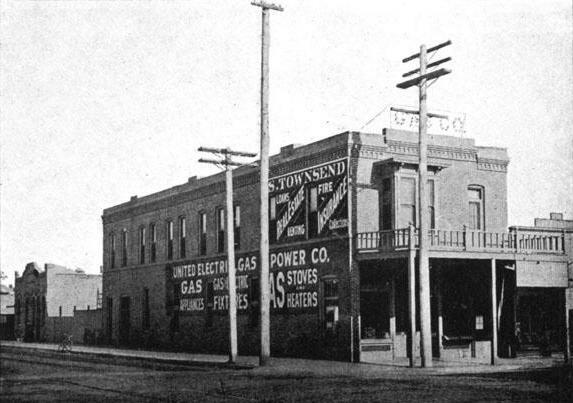 United Electric, Gas and Power Company office and sub-station, located on the corner of Pine Avenue and 2nd Street. 1902. It’s difficult to imagine a world without electricity, but it wasn’t until October 21, 1879, after spending more than $40,000 in fruitless experiments that Thomas Edison invented the incandescent lamp, and it wasn’t until 1887 that he perfected electric lighting. From 1895-1899 Long Beach made international news, not because of its growth, tourist attractions, or weather, but because of an oddity: Mrs. Iva E. Tutt, the world’s first female electrician. On September 6, 1895, the Long Beach Electric Light Company incorporated with Iva Tutt as sole member, owner and manager. Her company contracted with the town of Long Beach to erect and maintain poles, wires and lamps for lighting the municipality, and to furnish the electricity for one year, beginning October 1, 1895, at the rated of $42 a month. Others failed to provide lighting for the Tabernacle building (shown here), but Iva Tutt succeeded. The Long Beach Electric Light Company wasn’t the first electric company in the city. On April 18, 1895, Robert Benzie, operator of the Long Beach Steam Laundry, received a 25 year franchise to operate an electric light plant for his business and provide lighting for the City of Long Beach. It was enough to generate electricity for his business, but not effectively for the entire city. It seemed the lights put in at the Tabernacle (Long Beach’s largest meeting hall at the time) , and attempts to light the streets often met with failure, according to the August 3, 1895 Los Angeles Herald. Much hope had been put on the wave motor generator erected on the old Pine Avenue Pier, but that too failed to meet expectations. Mrs. Iva Tutt thought she had a solution. On October 1, 1895, Mrs. Tutt sold a one-fifth interest in the power plant to Charles C. Glass, and in March 1896, they sold everything to the Long Beach and San Pedro Electric Company. The Long Beach and San Pedro Electric company incorporated in March 1896, with a capital stock of $50,000, of which $25,000 was already subscribed with Iva E. Tutt, subscribing $18,650; E.S. Tutt, $1250; Charles C. Glass, $5000; J.H. Brady, $50; Will M. Glass, $50. Located in an alley extending north from Ocean Blvd. between Pine and Locust, the plant was put into operation later that year. According to historian Walter Case, it was publicized as the “first electric plant in the United States, and probably in the world, to be installed and managed by a woman.” Even more surprising, she was described by the media as being an extremely beautiful woman, making it even more amazing to the mind set of that time that she should choose such a career. In an interview with the Los Angeles Herald on June 7, 1903, Mrs. Tutt described how she became an engineer. She was born in Wisconsin in 1882 into an engineering family. Her father was an engineer, and she was his favorite, his “boy” as he used to call her, until by a second marriage he had a real son. He was a steamboat man on the Mississippi, and he used to take his daughter with him and show her all the machinery. She liked nothing more than to play with the cogs and pulleys, or watch the governor on an engine whirl round and round. She learned machinery, just like she learned to talk, without realizing she was doing so. Instead of reading fairy tales, she read the engineering reviews and scientific papers her father subscribed to. If she couldn’t understand what they were saying she would ask her dad and he would explain them to her. She married Edward Stanley Tutt early in life and left her home in Minnesota to be a rancher’s wife in Montana. She hated ranching and took money she saved and decided to invest it. She came to Los Angeles and discovered there was need for an electric light plant in Long Beach, and decided that was where she’d put her money. She looked for someone to manage the company and couldn’t find anyone who seemed better able to do it than she was, so she took over becoming the superintendent of the company as well as the president. Though she had never taken a college course, she understood machinery, and the rest of the knowledge about electricity came easily enough. Her little daughter and Mr. Tutt followed. With two steam engines of 125-horse power each, the Long Beach plant flourished and soon she was laying a cable across the San Pedro harbor to supply lighting to San Pedro. Gradually the service also extended to Terminal Island, where a long line of electric lamps were maintained on the beach front, and electricity supplied to the hotels and most of the cottages. Mrs. Tutt also secured the city contracts for street lighting in both San Pedro and Long Beach. Besides her business and housekeeping, she found time for church work, and singing in the choir. But trying to do everything began to get her down, and she decided to sell the plant. In September of 1899 the Long Beach and San Pedro Electrical Company was sold to the United Electric Gas and Power Company, which serviced coastal communities from their plant in Santa Monica. Later, in 1903, the Southern California Edison Company entered the scene by constructing a steam generating plant on the west side of Long Beach, close to the existing facility. Mrs. Tutt was a rich woman and could retire to do nothing if she desired. But the pettiness and trivialities of having afternoon tea parties proved wearisome and she looked around for another project. She found one in Arizona, a three million dollar power plant enterprise to supply power exclusively for mining purposes. She had discovered two unused water rights that could be purchased at a reasonable price. Her ingenuity in reducing costs by half meant a revolution in the mining industry of the state. Mrs. Tutt is not the least bit mannish appearing, and is not sunburned more than the ordinary woman at this time of the year. Occasionally she goes into the wilderness with her corps of surveyors, but the work is primarily office work. Mrs. Tutt is a shrewd business woman.